Lang Tune Up Gauge 6 Non Magnetic Brass Blades features non-magnetic brass blades for transistorized systems. The sizes are permanently etched on each blade. Lang 25 Blade Feeler Gauge 12'' Long. Contains: Twenty-five - 12'' x 1/2'' blades with thicknesses: .0015 - .040. Lang 15 Blade Feeler Gauge. Contains: Fifteen - 3'' x 1/2'' blades with thicknesses: .002 - .025. Lang 9 Blade Feeler Gauge With Rule. Contains: Nine - 3'' x 1/2'' blades with thicknesses .002 - .025 with steel ruler. Lang 22 Blade Feeler Gauge 2 5/16'' Long. Contains: Twenty-two - 2-5/16'' x 1/2'' blades with thicknesses: .004 - .025. Lang 17 Mini Blade Feeler Gauge. Contains: Seventeen - 1-3/4'' x 1/4'' blades with thicknesses .010 - .035. Lang 15 Lang Blade Feeler Gauge With Rule. Contains: Fifteen - 3'' x 1/2'' blades with thicknesses .002 - .025 with steel ruler. Lang Tune Up Gauge. Contains: Nine - 3'' x 1/2'' blades with thicknesses .002 - .044 with steel ruler and electrode adjusting tool. Lang 22 Blade Go-No-Go Gauge. Contains: Twenty-two - 3-5/16'' x 1/2'' step-ground blades with thicknesses .004-.006 through .025-.027. Lang 15 Blade Metric Feeler Gauge. Contains: Fifteen - 3'' x 1/2'' blades with thicknesses .06mm - .70mm. Lang 25 Blade Metric Feeler Gauge. Contains: Twenty-five - 3'' x 1/2'' blades with thicknesses .04mm - 1.00mm. Lang 32 Blade Feeler Gauge. Contains - Thirty-two - 3'' x 1/2'' blades with thicknesses .0015 - .035 and .010 brass blade for transistorized engines. Lang Master Thickness Gauge. Contains: Thirty-one steel and One brass - 3'' x 1/2'' blades with steel thicknesses .0015 - .035; brass thickness. Lang 26 Blade Feeler Gauge. Contains: Twenty-six - 3'' x 1/2'' blades with thicknesses: .0015 - .025. Lang 8-Blade Feeler Gauge 9'' Long. Contains: Eight - 9'' x 1/2'' blades with thicknesses: .002, .003, .004, .005, .006, .008, .010, .015. Lang 9 Blade Feeler Gauge. Contains: Nine - 3'' x 1/2'' blades with thicknesses: .0015, .002, .003, .004, .006, .008, .010, .012, .015. Lang 36 Blade Combination Standard and Brass Feeler Gauge. Contains: Thirty steel and six brass blades - 3'' x 1/2'' with steel thicknesses .002 - .035; brass thicknesses .006 - .016. Lang 35 Blade Feeler Gauge. Contains: Thirty-five - 3-5/16'' x 1/2'' with thicknesses .0015 - .035. The 2300A Lang Tune Up Gauge 6 Non Magnetic Brass Blades is one of thousands of quality tooling products available from MRO Tools. 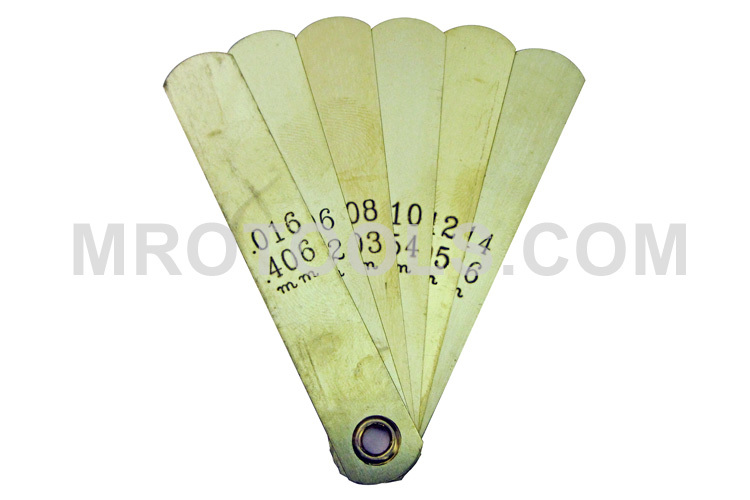 Please browse Lang Flat Gauges for tools similar to the 2300A Lang Tune Up Gauge 6 Non Magnetic Brass Blades. 2300A Lang Tune Up Gauge 6 Non Magnetic Brass Blades description summary: Lang Tune Up Gauge 6 Non Magnetic Brass Blades. Contains: Six - 3'' x 1/2'' blades with thicknesses .006, .008, .010, .012, .014, .016 Quantity discounts may be available for the 2300A Lang Tune Up Gauge 6 Non Magnetic Brass Blades. Please contact MRO Tools for details.